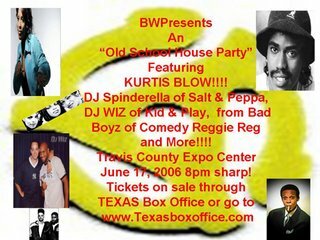 Thanks to Omit for peepin us to the Old School House Party coming to the Travis County Expo Center on June 17th! What a line up! 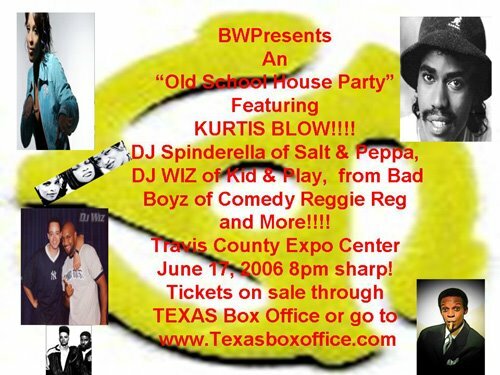 Definitely a blast from the past with Kurtis Blow, Spinderella, and Wiz... LOL! You can get your tix here. As the first commercially successful rap artist, Kurtis Blow is a towering figure in hip-hop history. His popularity and charisma helped prove that rap music was something more than a flash-in-the-pan novelty, paving the way for the even greater advances of Grandmaster Flash and Run-D.M.C. Blow was the first rapper to sign with (and release an album for) a major label; the first to have a single certified gold (1980's landmark "The Breaks"); the first to embark on a national (and international) concert tour; and the first to cement rap's mainstream marketability by signing an endorsement deal. For that matter, he was really the first significant solo rapper on record, and as such he was a natural focal point for many aspiring young MCs in the early days of hip-hop.